Why Lehigh MR-2540 Diamond Cut Machine? Lehigh MR-2540 alloy wheel diamond cut machine is guaranteed to be the most reputational equipment which have been widely used by more than 70% of the professional rim repair shops in USA and CANADA as well as many other countries. On the top of that, Lehigh MR-2540 alloy wheel diamond cut CNC lathe is also considered the most economical machine among all. 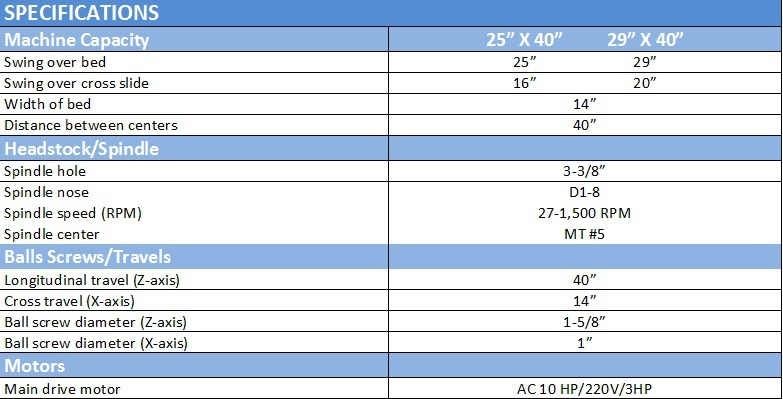 The matter of the fact is that the cost over each wheel to be machined by using top quality Lehigh MR-2540 rim refinishing CNC lathe can be less than 25 cents for each rim based upon the statistics from many production shops in USA and CANADA. "We bought our first Lehigh in 2004, when we got busier we added a second in 2013. We run two shifts 5 days a week, and both machines are still going strong. If there is ever a problem, I just call Lehigh and majority of the time we get the machine back up the same day with local parts. Always thanks for Lehigh's help." "My first machine purchase the SR-2410 rim straightener, was back in 2005 followed by the MR-2540 CNC Lathe in 2006. Lehigh Machines dependability and quality can’t be beat. The short time these machines use to complete their tasks, has made us far more profitable than anything I have ever seen on the market since. Steven has always been available to answer questions and knows his product inside and out. I don’t see how a shop can function without these two machines.​"
"The MR - 2540 has been an invaluable addition to our business. It’s simplicity to use matched with its superior finish can’t be matched by any othe product on the market. The support from Steven and the team at Lehigh has been fantastic. I highly recommend this machine to anyone who is serious about alloy wheel repair.​"
"Still on the job after 18 years. 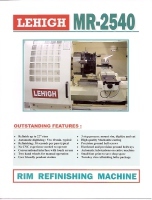 This Lehigh MR-2540 CNC lathe was the first purchased from Lehigh Machinery . It has given us great service and still produces a top quality machine finish. We recently had to replace the mother board in the pc. 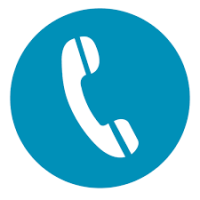 We contacted Steven at Lehigh who has always been available to help with any problems or answer any questions. In a short time we had this machine back on the job. Because of the trouble free service from our first Lehigh MR-2540, we have also purchased a MR-2940 model to handle larger diameter wheels. It also produces a top quality machine finish.​"
"Well built, safe, easy to operate, high production output, and great cut quality. I’ve compared and used many different CNC machines, the MR-2540 is my only recommendation to my clients." "We have had our Lehigh MR-2540 Alloy Wheel CNC lathe since the year of 2011 and have only changed a couple of service parts by far for which Steven & their team were always available to help and get us through quickly. Lehigh provides not only top notch quality machines but also great services after the sale with expert customer's support. The MR-2540 alloy wheel CNC lathe is one of the most used and valued machine in our facility. We get customers on a daily basis with the top quality jobs that the MR-2540 alloy wheel CNC lathe provides and that also enhances our product standard that we set for the reminder of our work. As always, Thanks for everything from Lehigh!" "We purchased both the MR-2540 CNC lathe and the SR-2410 wheel straightener in 2012, of all of the equipment we purchased to start our business these two pieces have been the most reliable of all the equipment, they are quality built and perform exactly as we were told. The customer services, Steven & Lehigh team provide, is bar none the best I have seen in the automotive repair industry. We would not be able to provide our customers the level of quality and speed without these two pieces of equipment. I would highly recommend Lehigh to anyone that is looking for high quality equipment that is pertinent to obtaining the level of quality and turnaround time desired by customers!" Great machine and excellent customer service! 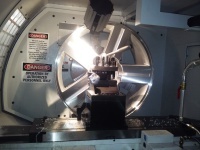 "We purchased the Lehigh MR-2540 diamond cut wheel repair CNC lathe in the beginning of 2012. The diamond cut wheel refinishing CNC lathe machine is well built and very easy to use . During the seven years, whenever a question or a problem arises, they are quickly sorted out by email or by phone along with shipment of spares if required. " What is the Work Process for Diamond Cut Wheel Machine? There are a few simple steps for using Diamond Cut Wheel machine. After one alloy wheel is installed on the CNC lathe, the operator will determine which part of the rim surface is going to be machined. From that position, a digitizing probe will be used to record the profile. Then, this profile is going to be used as the path for diamond cutter to machine off a very thin layer (0.005”) of the wheel surface in order to generate the brand new refinished wheel surface. Even though this seems to be a very simple work process for most diamond cut wheel refinishing CNC lathes available on the market now. However, each diamond cut wheel refinishing CNC lathe has its own hardware construction as well as its own matched software. The overall quality and integrity from both hardware and software must work perfectly together to make a top quality diamond cut wheel machine standing out among all the equipment out there. While you only can buy one kind of alloy wheel diamond cut CNC lathe available, you need do your home work well. It is the overall performance and durability of that alloy wheel diamond cut machine will give the owners of the wheel shops the best value for their investment, not the initial price at all. To choose a low cost Diamond Cut Wheel machine for production purpose could result in spending lots of more money and valuable time to fix various problems and plus unexpected business interruptions and many unhappy customers. This kind of situation could be a major miscalculation for some start-up shops.